Sunday September 15th 1878 I helped considerable with the work this morning and then dressed and went to church. The sermon was so interesting. Went down to Mrs Middletons before I came home to tell her she could go to the valley with Mother in the afternoon. I did up the work after dinner fixed thing for supper and rested what time I could get to. Weather much warmer. Monday September 16th 1878 I got an early start at the washing and by eleven oclock had it all out and myself dressed ready to work on my new calico dress. I could do nothing with the new pattern and took my work and went over to Wins and stayed the rest of the day. Rob and Mother was over late in the afternoon and I rode home with them. 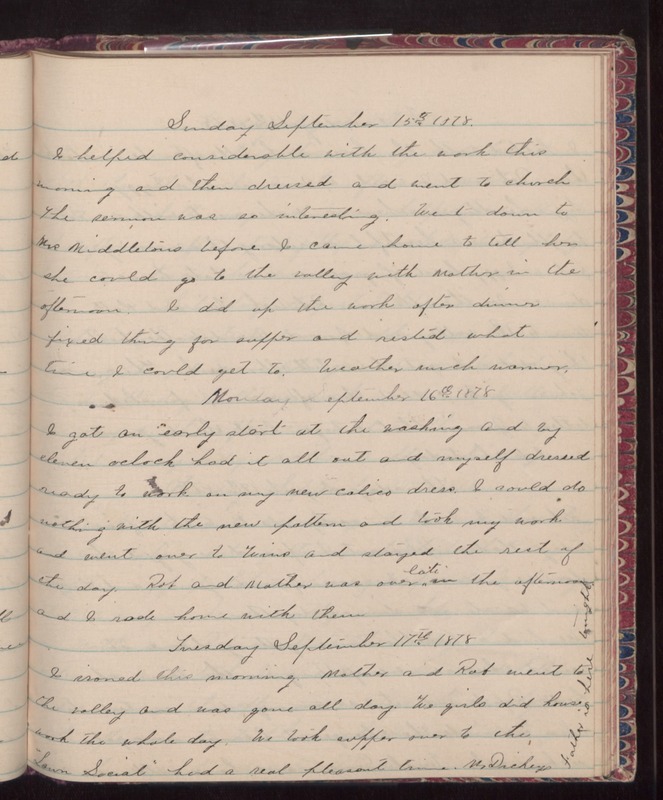 Tuesday September 17th 1878 I ironed this morning. Mother and Rob went to the valley and was gone all day. We girls did house work the whole day. We took supper over to the "Lawn Social" had a real pleasant time. Mr Dickey s father is here tonight.